I recently received an email from Jen asking me if I'd be interested in reviewing her online store, All Things Ribbon. I'm all about anything having to do with ribbons (especially pink ones) so I jumped at the chance to browse around her shop. I fell in love instantly and offered to host a giveaway for her. Luckily, she was interested! Jen graciously sent me 5 sets of absolutely adorable clips for my little Pumpkin Doodles to try...beautiful korkers and gorgeous classic bows which go with everything! (That's her, on the right, wearing one of the cute korker bows. It accessorized her fairy costume on Halloween - see yesterday's post.) She has somewhat thin hair and they stay put perfectly even when she tries to tug on them. Let me also say that the photos of on Jen's site do not do them justice. They are beyond gorgeous! There are SO many to choose from. I honestly had no idea all the fun you could have with bows! Jen's options are limitless! Just to name a few, she has Polka Dot Hair Bows, Headbands, Mary Jane Headbands, Small Stack Hair Bows, Streamer Stacks, BIG Stacks, Newborn Bands. Oh and don't even get me started on these GORGEOUS dresses ... Megan's Dress Closet. I'm in love with way too many of them. SPECIAL OFFER: Jen is fabulous and has created a coupon code for all Pennies In My Pocket readers. Isn't that so wonderful? Enter Coupon Code: pennies - receive 15% off on your ENTIRE order...includes the dresses as well!! Also, if you sign up for her nifty newsletter here, you'll receive the heads up on promotional offers and coupons exclusive to their mailing list customers! Entries will be accepted until Tuesday, Nov. 11, 2008 at 11:59pm PST. A winner will be randomly selected and announced as well as multiple alternates. The winner will also be contacted if contact info is provided. The winner will have until Sunday, Nov. 16, 2008 11:59pm PST to claim the prize by emailing his/her full name and mailing address. If the winner does not respond by the given date, the first alternate to email his/her info will receive the prize. This is a phenomenal shop! Since I already have the holidays on my mind, I'd love a super cute set of the snowflake clippies for my snowflake! I love almost every etsy shop I've ever visited, but I really like this one! Chloe can be wearing a plain & simple outfit, but if I throw a ribbon in her hair, then voila - it's suddenly a fabulous outfit! Also lovin that brown little dress - too cute! Those are beautiful little bows and hair accessories!! My one and only daughter is such a girly girl. We would love to win this! A wonderful store!!! I too love all things girlie for my little girl!! Oh, I'd definitely have to get some of those great hair accessories for my girls. Girl - I would spend another $20 on top of that gift certificate and get the Red Holiday Dress for Lorelai! What an ADORABLE dress for Christmas! There is just too much to pick from! I love the hair bows- the Pink and Argyle and the Hot Pink are so cute. I also love the Pink with Hearts, and the Ballet Slipper Stack. I would go well over the $25 gift certificate, that's for sure!! I'd get some of the Solid Classic Bows for everyday, and some of the Petal Place bows for special occasions! I'm definately in on this! I love the Mary Jane headbands, especially the pink and brown polka dot one, it would look so great on my little niece Ava! That brown dress is so adorable! I love the Hot Pink and Green Circles Korker Flower bow. Actually I love them all! I'm lovin' the solid korkers in tomato red, shocking pink and white. So many adorable choices! I ADORE the Brown and Pink Stack !!!! ONe of my favorites is the TOO Cute Black Velvet bow. I love the korker bows. I have really boughten a bow and then had to buy her an outfit to go with it! CRAZY!! How do you choose! I love all the holiday ones! They're so cute! I'm loving the corck screw ones and the stack ones! Hot Pink and Black Korker Flowers, Hot Pink Stack with polka dot headband, and Pink Marabou are all so super cute and I love all the pink!! Love the brown & pink stitch dragonfly style bows. All the dragonfly bows are too cute! I love the dragonfly bows and the rosy pink retro bow. I would have no issue spending $25 here for my little princess! i LOVE the chocolate and raspberries korkers! i love the pink and brown together. Pretty much one of everything from the Too Cute line! I have just recently discovered the hair bow craziness and I am so in love. I just ordered some for Claire, but she can alway use more especially one for Christmas. I am off to check out the site and I hope I win the contest. Now that's some gorgeous stuff! I would love to purchase one or two of those beautiful dresses. I have two girlies, so maybe a matching set. I would go beserk in the ribbon aisle ( as usual). I love the classic bows and satin headbands. Love it! Wow! Those newborn headbands are ADORABLE! I could spend all my money right there! So cute! I love the red holiday dress but my daughter hasn't yet gone a day of her life without a bow in her hair so we are always looking for more cute bows and there are so many to choose from I love it! Oh my gosh, the Dragonfly bows are too cute for words! I would love to get the Pink Sundress for my daughter. Their stuff is great! I would get the Pink Sundress. Thanks for the contest! Oh I will have to go check it out! I have a really cute headband dealio (I am sure everyone with little girls has them....oh wait, I don't have kids......) that you can interchange the clips on it. These would be SO perfect! I can plan ahead right?! Ballerina Giselle Streamer head band and the Candy Cane and Snowflake Headband. Really cute things for little girls, lucky for me I have two little grand neices! She has adorable stuff and I couldn't believe the great prices!! I love the collections, the streamers, the mary jane headbands.....everything!!! BTW, I finally updated my blog with Portland pics. Cute things! I love the peach and brown streamer stacks. Beautiful! Also... I would by the black velvet head band for my little niece. She would look so cute with that on! The whole holiday hairbow collection is fantastic. And the dresses are beautiful! great shop ! awesome items , everything great ! thanks for the opp! Ok..so you've so got me hooked on this shop!! I would love to win!! I would most certainly buy a couple newborn head bands and one of the headbands with curly clips!!! Thanks for the heads up-I'll be shopping there for Christmas!! 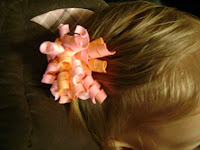 I love the Hot Pink alligator clip bows! My little one would look cute rockin' those. Not that I ever win anything, but if I did happen to win this giveaway, I would probably load up on some classic bows and polka dot bows. It's so hard to choose from such good stuff! I would put the money towards one of those cute dresses for my nieces Christmas present...picking which one will be the hard part! Oh... That is so cool (bout the lessons for your hubby) we actually have a guy at our church who has offered to teach me the basics, he plays on the worship team. So all i need to do is just get with him, and it's free, so I need to do that soon! LOL. *Thanks for the xtra entry, you rock! 1 for each of my nieces. Each one of the above perfectly suits their very individual personalities! Oooh, I love just about everything on her site!!! Especially the flower korkers! And that Valentine's korker is a thing of beauty! Plus I would love to have a few sets of classic bows for my girlies too! I love love love love the red and white polka dot sundress! It's gorgeous (as well as everything else on that website!!). I would love the woven headbands and corkers for my daughter, there are so many amazing colors I would have to let her choose though! Ribbons YAY! I can't wait to go check out her site. First, I love all these bows!! I would like to get Milk Chocolate and pink on snap clips, the brown and pink polka dots corkers, and the rosy pink retro double hair bow!! Wow! I would like so many more too! 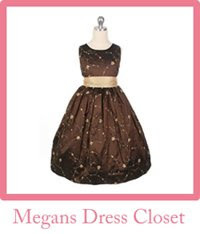 the brown and mocha dress and the frosty blue frock are Gorgeous! I was gonna wait for 4 more people to comment but then decided to settle for commentor 64. I would like to use the gift certificate towards a Brown and Mocha Dress if another is put in stock. If not, the Peach and Brown Organza dress is adorable too! Oops! I forgot to say but my email address is in the profile. Thanks so much! My favorite is the Brown Velvet and Polka Dot! That's what I'd get with the gift certificate and I know the little girl who would get them. Love the bows--it's so hard to choose a favorite (OK maybe the petal ones) and those dresses--My God! So gorgeous and so reasonably priced. Definitely bookmarking that site. I would get the sweet Pink and White Giselle Streamer and the Red Holiday bow for my little granddaughter. Very pretty items! Cute site, I cannot wait to get home and catch up with everyone! Love the bows!! My favorite would have to be Floral and Celadon in the too cute section. These are so great. Thanks! I love all of these beautiful things! I would get my oldest daughter a couple of the Woven Headbands and I would get my newborn daughter one or two of the Newborn Bands. Thanks so much for such a great giveaway! I love the Snowflake too cute clips!! I can't believe how affordable the dresses are! I would put the money toward the brown/mocha dress. I think I could spends hours browsing through this site!! There are so many choices! I really like the Black polka Dots with Hot Pink Korker Flower. This is a really fun bow! HOW CUTE!!! I would get all the newborn headbands since my baby girl is due in March and babies don't really have a lot of hair!! I really like the Petal Place Hair Bows and Double Hair Bows. So cute! My goodness they have SO many choices! My first pick would be the Pink and Argyle bow! What a wonderful shop! Thanks for running this giveaway so we could all discover it! My favorite item from AllThingsRibbon.com (and it's hard to choose, because I like so many) is the Snwoflakes and Candy Cane Korker, which I think would make a perfect gift for my niece! If i win the gift certificate, I will use it towards a dress for her from the Megan's Closet section of the shop, and get the hair ribbons to go with it! I'm Viv, from Cool Moms Rule, and my email is vbruss AT cfl DOT rr DOT com. I love the brown ribbons with the pink polkda dots, and the Mary Jane headband! How cute. black velvet & flowers clip (from too cute section), black velvet & white clip (too cute section) and the city sparkle small stacks (from the made to match section). Thanks for the great giveaway! Love the brown ribbons with pink polka dots. Wow, what fun stuff! My favorite is the Too Casual korker ribbons. The colors are great! I would also get the Green and Pink ribbon flowers and the Ivory newborn band. 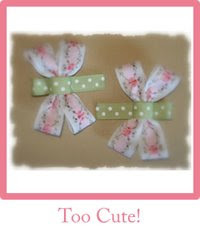 And the Floral and Celadon clips - adorable!! Its such a cute shop and I totally love the slogan "finally a bow to buy an outfit for"
if we won we'd probably be sure to select a mary jane headband (adorable) and a streamer stack hair bow... my daughter would love both of those. I would get the Sage Sundress in the infant size and a bigger one from Megan's Dress Closet for my 2 girls! I would get a bunch of new pretty korker bows for my daughter....these are the kind of bows she wears all the time! I think the pink sundress is gorgeous! I love the Sweet Pink Embroidered dress with sash. Beautiful! I would probably invest in some solid classic bows - to go with everything! Such beautiful dresses and bows... But, I would get a few of the quilt patterns. How cute and fun! Thanks! I really can't decide. Either the dragonfly clips or put the money toward a gorgeous dress! Everything is so beautiful! I'll come back on the day the winner is announced. Thanks! I like the Brown and Turquoise Stripes Korker Flower the most, we'd definitely have to get a dress to mtch those! I am in love with the Black Polka Dots with Velvet and I love the 'too cute' description. They look like GianT Panda butterflies. Thanks for your great giveaway. The big stacks are looking good for us, we like the Ballet Slipper Stack and the black and pink stack as we have plenty of clothes that would match up with these. There are A LOT of adorable items on this site. If I won, I'd get the brown checks on snap clips, ladybugs on snap clips, and milk chocolate and pink on snap clips from the Petal Place Hair Bows Collection. I love the brown multi small stack, tan multi stripes maryjane and the black and white streamer! Oh Wow! The Sage Sundress Infant (18 mos) would be my choice without a doubt! I really like the red embroidered dress--but I'd get a selection of double hair bows and classic bows. I'd get the Red and White Small Stack, and Medium Bows in Pink and Papaya. The hair bows or dresses would be great! Love the Candy Corn, Snowflakes and Candy Canes and the St. Patrick Korker Flower. Think the sundresses are the cuties things. Everthing is so cute. This is such a great givaway. with 3 girls i could always use ribbons I would buy holiday one! I'd love to get a couple of the Mary Jane headbands! Thanks! This site is so up my alley, I love bows! But what I really love the most is the Brown and Mocha Dress- it would look so adorable on Faith, I love brown on her :o) Good luck to everyone!! I'd buy the solid classic bows since we loose so many thanks. Brown and Light Pink Stack and the Snowflakes and Candy Canes Korker Flower for the holidays. I would like to get the little bow brown and white multi. 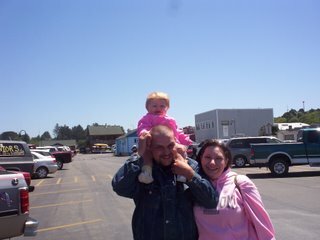 But I am diffently going shopping there if I win or not, my little girls would love them. Wow! It's so hard to choose. I really like the Black polka Dots with Hot Pink Korker Flower, Black and White Daisy Headband and the Ladybugs on Snap Clips! Thank you!! The snowflake clips are totally adorable! I would buy the frosted blue dress for my Rowan. She would look adorable in it. This store has become a fast favorite for me! Since I'm in the Christmas mood, I would love to get the Candy Cane and Snowflake Korker Flowers! So cute!!! Oooo Like I said in my post about the SITS giveaway, I have been drooling over their bows since I learned that I was pregnant!!!! I would buy a bunch of korker bows (love those) and the Pink Retro Mary Jane headband!! I would get one of the really cute dresses for my niece for Christmas. I have three boys. . .darn. But I have a TON of nieces! I saw this shop on SITS and love everything in it, especially the corker flowers. Those are so cute! My daughter has thin hair and like to pull things out of it too, so something that stays in would be amazing! I am so buying my little girl's Christmas dress at All Things Ribbon---just haven't decided which one yet! Would love to have a gift certificate to help me out...=) I blogged about this and linked up to you. Thanks so much! Hey fellow SITS! Great giveaway! I'd love to win, its fabulous! Love the little pink and brown dress! Love the headbands - they are the hair accessory of choice for my daughter. It's hard to decide what I'd do, BUT either I'd go for the Blue Holiday dress, which I LOVE or I'd splurge on a bunch of bows of all types. I can't narrow down which because they're all so neat that I can't decide which are my favorites :) And it's SO good to know they'll stay in thin hair, as Little Miss has exceedingly thin hair, and it's so frustrating when her bows fall out all the time! I love it all! BUT since Miss B is big into hair bows I would stock up on the stacked hairbows. I think the pink and brown stacked one is super cute. I absolutely love the butterfly field quilt and several of the others that would be perfect for Christmas. I also loved the dragonfly clip, especially in hot pink. My little dress up girly girly would love them. I'd get the Pink and Cantaloupe Stack Headband. I love this store....my girls are too big for the dresses....but not the handmade bags. I couldn't find a sample of them when I clicked on that choice. But I know they must be so pretty. So many pretty items to pick from. I really like the beautiful Ballerina Giselle Streamer. I'd have to get the Korker Flowers. I can't resist the brown and turquoise ones in particular. I'd get some of the Solid Classic Bows for everyday, thanks. So many lovely choices for my 10-year old god-daughter (who has long flowing brown hair). For starters I buy her "Beautiful Victorian," "Chalk Violet Victorian," and "Pink Marabou" - then I'd break into my piggy bank and buy the "Ivory & Pink & Lt. Sage Small Stack Hair Bow. And all of that would just be for starters! my daughter wants korkers so bad, she has been asking for them for the longest time so I would buy her some korkers for her birthday in January! I would love just about anything in that store. I would probably buy so much more than the gift certificate!!! Too cute! What a great site!!! I would choose the Pinks, Ivory and Brown Headband Set. It is too cute!!! I love the pink and brown dress! Linked you up to my blog! I would buy the woven headbands, they are so nice. well...i have a new baby girl [and a crazy 2 1/2 year old girl who LOVES fancy nancy pretties]...so i'm all over this! I WOULD CHOOSE: Pink Retro Mary Jane Headband [$6.95], Brown and Pink Swiss Dots Mary Jane Headband [$6.95], Black Velvet and Flowers ‘Too Cute’ alligator clips [$6.95], White Newborn Band [$5.95]. OVER BY $1.80...level of cute - PRICELESS ;) thank you!! I would get some of the Petal Place bows. Thanks for the giveaway! I would buy the Aqua and Blue Stack! I'd get the Sweet Pink Embroidered dress with sash in size 8, I know twin girls who'd love it! There are too many choices... I like the Hot Pink bows in the Too Cute! collection and the pink or magenta Flowers. With two girls, this is a great site for us! That Sage Sundress is GORGEOUS!! I'd absolutely get that! I like the Hot Pink and Green Circles Korker Flower bow. Brown Retro Circles Too Cute Clips remind me of butterflies. One of the things that I really like are Black Polka Dots with Velvet and also the holiday bows are beautiful. What cute stuff! I would get some stackers AND start a holiday hairbow collection for my girls! I would get the pink sundress. It's adorable and could be used for Easter. I love the Sage infant sundress!! Super cute! Wow! What a tough choice. Everything is wonderful but I would buy Flowers and Stretch Band . I usually adopt a child for Xmas so this I would give to a little deserving girl for the holidays. Thanks. Black and White Polka Dot Sundress is one of my favorites! I love picking out and buying hair accessories for my 2 little girls! I would buy the Pinks, Ivory and Brown Headband Set. Thanks! I lurve the flower ones-I'd probably get a blue and magenta one for myself and give the rest as a christmas present or something! What a fabulous store! Oh the fun I could have spending the $25. I would buy the MOD Headband with Stack Bow and the Steamer Stack in Black and White. I am sure I would find many more things to buy as well. The Pink Petal with Satin Headband is so cute! Thanks for the giveaway! The solid korkers in tomato red, shocking pink and white, so many ones to pick from, it's hard! The Pink Petal with Satin Headband is cute!ty 4 the entry! I like the Brown and Light Pink Stack and the Black and Light Pink Stack. If I were lucky enough to win, I would purchase the Peach and Brown Organza Dress. It is to die for! I like the satin headbands. They come in pretty color and will go with any outfit. I would get the Scotty Dog With Polka Dots Headband, the Ladybugs on Snap Clips, and the Poodles in Black Korker Flower. The Pink Sundress is gorgeous! Red and white flowers are so beautiful, especially at this time of year. Wow, thanks for the giveaway, that is so generous of you. Pennies in my pocket is an awesome blog! keep up the solid work sister. This was a great giveaway, too bad I missed it. Allthingsribbon is a great site. I'm sure the winner will enjoy the gift certificate.